Catsparella: Kafka Goes Kitty in "The Meowmorphosis"
Quirk Classics, an imprint of Quirk Books, has enjoyed mountains of success with their popular series of mash-up novels that combine literary classics with modern cultural references. You may be familiar with some of their standout titles, such as "Pride and Prejudice and Zombies," and "Sense and Sensibility and Sea Monsters." Most recently, their latest take on the quirk-ified classic is "The Meowmorphosis," a retelling of Franz Kafka's haunting tale of transformation... now with more kittens! The plot is similar to the original, in that Gregor Samsa wakes up one day transformed into something other than himself, however this time it's not as a monstrous insect, but instead as a very large pussycat. The book trailer promises, "A version of Kafka's nightmarish tale with more anxiety, more terror, and more hairballs." "While the initial chapters stick close to Kafka's well-known novella, the book spirals out of control (in a good way) when Samsa leaves his parents' home to relieve them of the burden of caring and feeding for such a large, adorable kitten. Co-author Coleridge Cook (a pseudonym for an award-winning fantasy novelist) describes Samsa's feline behavior in detail, and not a page goes by in which a piece of furniture is not scratched for perched on. Bowls of milk are lapped at, and humans are snuggled with. Will cat-lovers enjoy "The Meowmorphosis"? Yes -- there's no doubt in my mind that cat-lovers will find Samsa just as cute and cuddly as his sister does in the story. I'm a dog person, and even I was LOL-ing by the book's end." 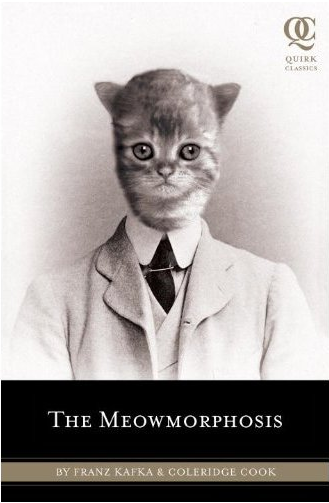 "The Meowmorphosis" will be released in bookstores on May 10th, and is available now for for pre-order on Amazon! Oh that sounds funny! We have seen Pride and Prejudice and Zombies and one other (not the Sense and Sensibility and Sea Monsters though) but hadn't read them (thought about it) but this sounds like it should be at the top of the list!